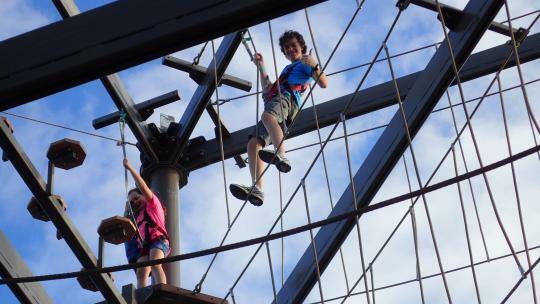 Open weekends and Victorian School Holidays, the SkyTrail is a 10 metre high adventure ropes course set on a zig zagging series of giant poles and platforms. 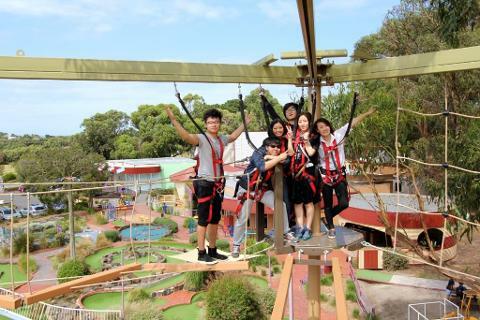 It gives the very adventurous clients a new exciting activity, but still offer those who are a little more reserved, a chance to challenge their fears and get a healthy shot of Adrenaline in complete safety. The SkyTrail allows customers to choose their own path through a series of aerial challenges, whilst permanently harnessed into an overhead track. This ensures 100% safety, as it is not until you reach the ground that you can remove your safety life line. It is suitable for all adults and children with a reasonable level of fitness and over 140cm tall. Please Note: Participants must be a minimum 120 cm height to climb and if under 140cm height they will need a adult chaperone which will require an additional ticket.